After seeing a poached elephant first hand, founder Margot Raggett decided to spring into action and really do something to help; not wanting to be someone who sees the destruction in the world and simply despairs about what to do before going back to her everyday life. After speaking out to photographer friends and getting in touch with some of the current leaders in the industry, she quickly found that everyone was willing to help when it came to an initiative to protect these creatures that are so terribly running out of time. 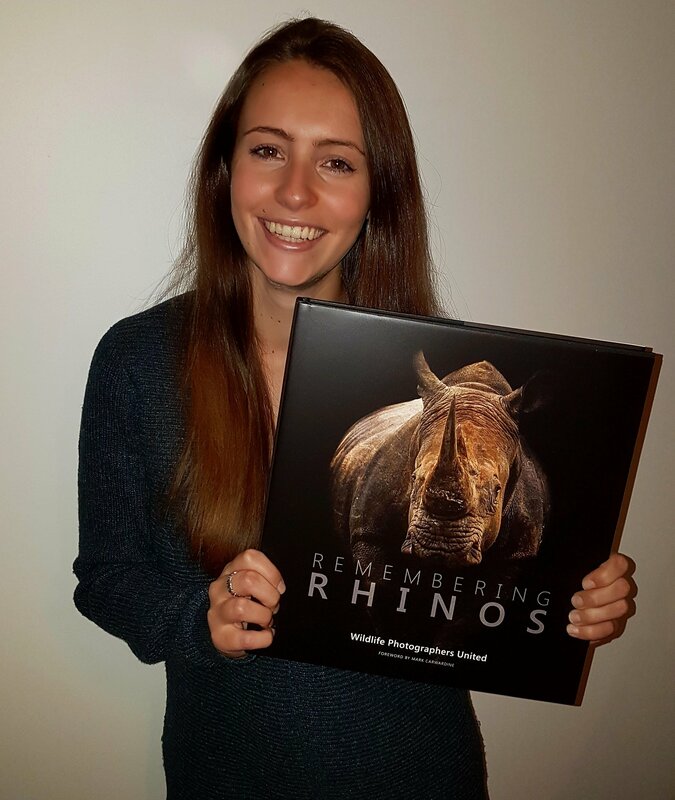 All of the photos in the book were donated by the photographers, and the initial funding of the book printing was raised by a Kickstarter campaign back in February, meaning that 100% of the money spent on purchasing a copy of Remembering Rhinos goes straight into conserving them on the ground. Why do we need to protect rhinos? Rhinos are in dire need of our help. We hear about their declining numbers but do we really know the full extent of the problem? There are currently five species of rhino left in the world, two in Africa and three in Asia, of which one of the species, the Javan rhino, have less than 60 individuals remaining. The preposterous reason behind the slaughter of so many of these huge mammals is for their characteristic horn. Rhino horn is made out of keratin, which is the same substance that makes up our own human hair and nails. Yet there is a huge market for it in Asia, both for medicinal use, of which it has none, and for use as a status symbol. There have been countless claims from these markets where there is demand that rhino horn can be used as a cure for everything from a hangover to cancer. Together with this, the rhino horn market has recently had a huge shift with the demand being more for use as a status symbol. Yes, people would gain a product that a precious animal has lost its life for to be used to brag to friends, in the form of carved bracelets and jewellery pieces, as well as ground down as an alternative to cocaine. Poaching has now got so bad that for one species, the northern white rhino, there are only three individuals left in the entire world, two females and a male, all of which are incapable of reproducing. Anti-poaching patrols work tirelessly to protect these animals, but it is simply not enough. There is not enough funding to sustain it, and purchase the technology needed to aid these heroes in protecting these wonderful animals. But that is where Remembering Rhinos is doing a terrific job. During the event, I was honoured to be in the presence of great conservationists who risk their lives to protect these precious creatures. But unfortunately, that also means learning about the horrendous rhino horn trade. I was absolutely astonished to learn about the prices that people in Asia would pay for something that is exactly the same as the nails on their own hands; $80,000/kg for a rhino horn bracelet, $50,000/kg for a slice of rhino horn, and $120,000/kg for a rhino horn wedding ring, to name just a few of the many preposterous items. There is currently debate occurring about whether to legalise the sale of rhino horn or not. The thinking behind this is that rhino horn, unlike ivory from elephant tusks, grows back. Rhino horn is not connected to a rhino’s skull, and if done properly, it does not cause much harm to the rhino to “trim” the horn just as we would do our nails and hair. So why not just legalise the sale of rhino horn to eliminate the illegal market and stop the killing of rhinos? This is the argument of some people, but unfortunately it is highly flawed. In a perfect, imaginary world perhaps harvesting rhino horn would work, but sadly, not in our world. If rhino horn was sold legally for, $50,000/kg, poachers would sell it for $40,000. If rhino horn decreased to $40,000, the poachers would sell it for $25,000. At those prices, there is still an enormous profit to be made. We must also remember that the poachers on the ground are not the problem, and would do a lot of things to earn some money to feed their families; it is the heads of the poaching syndicates that are the cause of this market and the killing of the rhinos. Together with this, well calculated figures have shown that “rhino farmers” who harvest rhino horn do not have nearly enough to sustain the market, meaning that poaching would still continue to fill the current demand. Added to this the fact that the same idea was thought about legalising the ivory market a while back, thinking that this will eliminate the killing of elephants as demand for ivory was met with stockpiles. They were incredibly wrong which had a disastrous effect on elephant populations. I’ll never forget the time that I was working in South Africa with an anti-poaching unit and they told me that even if a rhino has had its horn safely removed by its owner, this will not deter the poachers and they will kill the animal anyway. It takes a lot of effort to poach a rhino, sometimes trekking for many days, cutting fences and risking their lives unseen, whilst tracking a rhino day and night. If the poachers then finally get to the animal to find that all they have is a small stump of a horn, they will kill it regardless and hack out that stump, knowing that that small part will still earn them more money than they would ordinarily make in years. It’s simple. Spread awareness. Share articles, images and videos that highlight the plight of our rhinos, how crucial it is to protect them and how important it is to educate people about the non-existent medicinal uses of rhino horn. Chew your nails. Save a rhino. How is losing insects affecting us? Btw, do I get your permission repost this? Reblogged this on The Wise Explorer.